The introduction of regional pay could see thousands of NHS staff in south-west England working longer hours for less pay, a leaked document has revealed. The BBC has obtained a copy of a document outlining the scale of the possible changes, put together by a consortium of local health trusts. But a major nursing union has reacted angrily, describing it as a "cartel" and has promised to fight the proposals. Sarah Zanoni, from the Royal College of Nursing (RCN), said her members wanted money to be focused on patient care, but staff should also be appropriately rewarded. "We'd rather the trusts worked in partnership with us, the trade unions, to try to work out how we can do things more efficiently. "They don't need to go to a cartel to start reducing people's pay and their terms and conditions." The document, by the newly-formed South West Pay, Terms and Conditions Consortium, is marked "For discussion only, not to be forwarded". A key objective is to reduce the pay bill from 68% to 60% of running costs, which the document suggests could be achieved by cutting salaries, allowances, leave entitlement, sickness benefits and making staff work longer hours. The document notes strong opposition to such changes from unions and raises the possibility that, to secure them, "trusts would be obliged to dismiss and re-engage staff". The RCN says NHS staff do the same work, whether they are in Truro, Torquay or Tynecastle, and so deserve the same rates of pay. It says nurses are angry and believe money would better be spent on patient care than setting up the consortium. If regional pay was introduced it would replace the current NHS national pay bargaining model. The government is considering introducing regional pay for public sector workers and the South West could be among the first areas to have it introduced. Ministers believe the private sector suffers because of the current system. They argue public sector salaries in the regions are higher than the true market rate and so the private sector struggle to compete for staff. 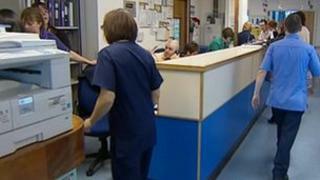 A spokesperson for NHS Employers said the consortium's document was not linked to the government's regional pay plan. No-one from the South West Pay, Terms and Conditions Consortium was available for interview. However, it issued a statement which said: "This is not about reviewing pay scales based on where people live - it is about exploring more flexible ways of rewarding and incentivising staff. "The project group will simply be considering possibilities at this stage, and will work closely with trade unions and staff representatives on any proposals that are subsequently developed. "The pay bill forms the largest portion of our annual expenditure and as such, it is right that we look at how we are spending that money. "We are exploring potential changes that could be made at a regional level, which would allow us to operate more efficiently whilst ensuring our staff are engaged and motivated to provide an exceptional service." The leaked document says the consortium aims to bring forward proposals on regional pay in the NHS in the South West, by October.